Some edge wear to colour illustrated laminated covers. Laminate has ballooned out loose across the spine but binding is still sound. 302pp. 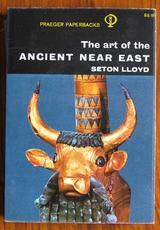 A thorough introduction to art and artefacts from Egypt, Mesopotamia, Babylon, Assyria, Persia etc. There are chapters on development and influences. Copiously illustrated throughout with many in colour. Also includes a chapter on architecture.